Guinness has launched “This is Rugby Country”, a television commercial designed to support the Guinness Series and the upcoming 2011 RBS 6 Nations. Real rugby fans are filmed in Irish autumn sunshine at various locations around Dublin and WIcklow, Ireland, including scientists from the laboratory based in Dublin’s Northside, fishermen on the West Pier at Howth, firemen at Ringsend, office cleaners at East Point Business Park and farmers in Co Wicklow, and local Dublin rugby players in the player’s tunnel at Aviva Stadium. Rugby Country is a place where the rugby team represents the people, their character, their pride, their determination and honesty. In Rugby Country every fan is made welcome, putting you at the heart of the Irish Rugby experience, drawing on a bond of pride that unites supporters across the Nation. The initial outdoor execution, which was shot in Slattery’s Bar in Dublin, now also appears in the TV ad with Slattery’s own bar manager, Alex Cordero. A similar shoot for a Munster specific outdoor ad, took place in Nancy Blakes’ pub in Limerick, a pub known for it’s strong Munster ties. This is Rugby Country will launch this week with a 60 second TV advert which is supported by heavyweight outdoor and an innovative digital participation campaign. This will follow with a 40 second TV edit for the 2011 RBS 6 Nations, whilst Leinster and Munster specific edits will air around key provincial games. Cinema will air in support of the 2011 RBS 6 Nations. The overall campaign will also include on and off trade engagement, PR, and a series of supporters events across the country, which will be hosted in partnership with Today FM, TV3 and RTE. 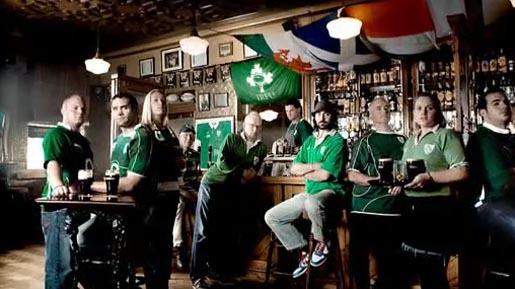 The Rugby Country campaign was developed at Irish International BBDO by creatives Mal Stevenson, Mark Nutley, Pat Hamill, account director Tanya English, working with Guinness brand manager Stuart Kinch. Filming was shot by director Alex Telfer with editor Lee Hickey at Windmill Lane, Dublin. Music is Grow﻿ Till Tall by Jónsi. Media was handled by Initiative Media. Public Relations were managed by WHPR. For further information about Guinness Rugby and to get the latest news from the Guinness Rugby players log on to www.guinness.com/rugby and Facebook.